Yesterday I ordered some groceries online. I thought I had ordered 1kg of carrots and 1kg of bananas. What I got instead was a single carrot in a bag and a single banana in another bag. This is one of the pitfalls of online grocery shopping. Don’t get me wrong here though, I absolutely adore online grocery shopping because I loathe going to the supermarket. But things like this happen to me quite often and admittedly they are mostly my fault. Once I ordered a bag of pegs thinking that I’d be able to hang out the washing with them. What I got was a small packet of miniature pegs about 1cm long. I have no idea what their purpose is but it’s not for hanging out washing. Internet shopping in the UK is brilliant. For grocery shopping, there are at least five different supermarkets to choose from and they all offer competitive pricing and some have free delivery. You can choose your delivery time to within one hour blocks so that you’re not waiting around all day for the groceries to arrive. Online shopping for other things is also brilliant. Delivery is usually free and often the very next day. Some of the freight companies will even send you a text message on the day to say “Gareth will be delivering your order between 3.30pm and 4.30pm today. Reply ‘1’ to reschedule or ‘2’ to leave with neighbour”. This is very civilised and not having to visit the supermarket on a weekly basis translates to a better quality of life in my humble opinion. Posted in Journal, Uncategorized and tagged delivery, groceries, internet shopping, online shopping, quality of life, shopping, supermarket, supermarkets. Bookmark the permalink. That’s really funny about the carrots and banana. The people packing your order must have wondered WTF! If there is one thing I actually enjoy, it’s grocery shopping. All that yummy food! Are food prices lower in the UK than in NZ and Australia? Food prices are considerably cheaper here than in NZ. I’m not sure about Australia as it has been a while since I visited. That’s another thing to really love about the UK. We have a lower cost of living here which means we can go on trips fairly often. I haven’t had any bad experiences so far. All the mistakes have been my own fault. If I had looked closely at my order I would have realised that 16p for carrots could not possibly equate to a kg of carrots. Lucky you to have a husband who cooks and shops! Our village shop has to put in a big wholesale order online every now and then and once we gave the job to a well meaning person who ordered a whole tray of *miniature* jams because they looked exactly the same online. Also someone in our village ordered a hog for a hog roast and got lbs and kgs mixed up so were desperately trying to flog pork for the whole weekend. I’m lucky I have a local shop, but online shopping for everything else is a godsend – not having to go in to town every time I want to buy something. I did laugh thinking about one carrot and one banana. It’s the sort of thing I’d do. The miniature jams is funny. I hope the shop managed to sell them all. It is difficult to tell from a photo how large an item is. This is a mistake I’ve made quite a few times with online shopping. I’ve got a half a kilo of curry powder sitting in the cupboard and I’ll probably never use it all. The container looked smaller in the photo. Rachel, once again you offer up something this country doest have, grocery shopping online. A few large companies are trying it out but they are using a system where you have to purchase the same items and quantities every month. I don’t think it will go over to well. I do shop a lot online, mostly from amazon.com there prices are hard to beat most anywhere on the web. I don’t understand why they would force customers to purchase the same stuff every month. I would not use a service like that. I am surprised that the US is lagging behind the UK on this one. I always thought the US was way ahead with customer service but it seems not. On line shopping in Australia is very popular and attractive too. Clothes, shoes, toys, craft, appliances, décor items etc etc. Most have free delivery and eta choices. Also no delivery fees and free returns if the items do not suit. I love it. Sounds like Aussie is ahead on NZ with regards to online shopping. If ever you’re feeling down about the UK, just come and read my blog. I love it here so much and I really don’t want to go back to NZ. Thanks, Sherri. So do I. If not, I shall at least treasure my time here. Of course the easiest way to get a single carrot home is to put it in your pocket, http://farm6.staticflickr.com/5348/9611880965_8aea64b63d_o.jpg. 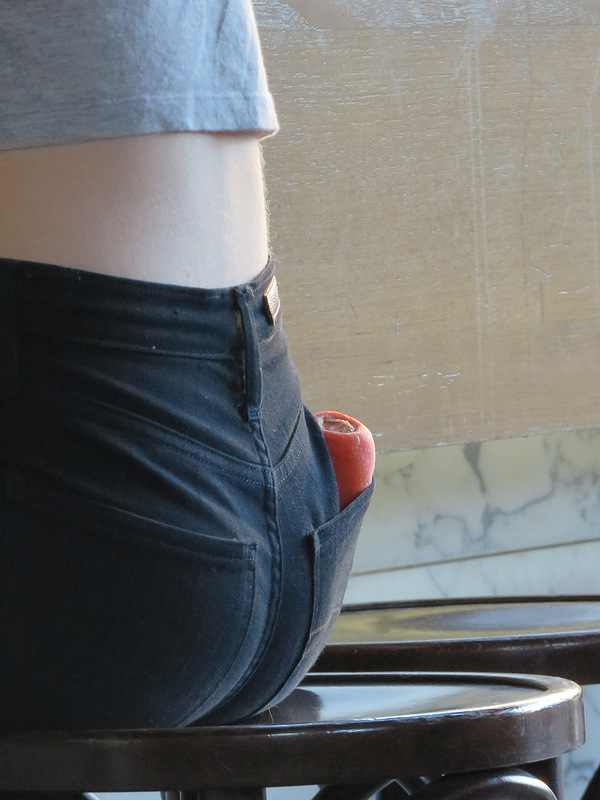 A single banana would easily fit in the other pocket. Grocery shopping is available online in Sydney but we don’t use it and delivery times are a lot less precise that the ones that Rachel has found. In any case we are only a few minutes walk from three supermarkets (the third one opened a couple of months ago). We also have supermarkets within walking distance of us which is just as well because I did have to go and buy some carrots and bananas yesterday. I don’t shop on-line with Coles or Woolies but instead with a mob called “Aussie Farmers”, a farmers’ co-operative whose representative came door knocking to our house one day and talked us into it. They come through the night, once a week, and I wake up to a soft esky or two of bread, milk, meat, groceries and other produce. I do, however, buy some items regularly from Marks and Sparks, underwear from New Zealand, coffee, Xmas cakes and books from America, pottery and wine from France, and an assortment of other goods from mainly Chinese and Aussie companies on eBay. A relative also bought drugs not available in Australia from a Chinese company on eBay. These drugs were available for treatment in Europe but not in Australia. About the only thing it is difficult to obtain at the moment are those electric cigarettes which governments are stupidly banning. I can understand why local retailers are concerned about Internet shopping. Wow. It certainly is a world shop for you. I’m not so sure about the Chinese-made drugs though and I didn’t realise you could import drugs into Australia without some sort of customs declaration. There was a customs declaration, of course, but officers are only interested in drugs that are approved here. Should this particular drug be approved in the future, import taxes will then apply. I think we all love sitting back in an armchair and shopping. We have a wonderful, efficient Australia Post courier who is run off his feet. I cannot believe what some people do today. How do they plan on staying in business. Word travels fast.